Tired of battling frizz and unwanted curl? A keratin treatment from Amato Hair Design in Mokena can transform your bad hair days into amazing hair days! Keratin Complex Keratin Treatments are specialty smoothing treatments that work to rebuild and restore the natural beauty and silky softness of your hair with natural keratin protein. Keratin Complex is the leading hair smoothing treatment in the world! In additiion to taming your tresses and removing wild frizziness, a keratin hair smoothing treatment has many other benefits. Keratin Complex helps to heal damaged, stressed out hair, blocks the effects of humidity, and seals each strand to prevent environmental toxins from entering the hair. No matter what your hair type, it can benefit from a keratin treatment! Our hair smoothing process is perfect for permed, color-treated, relaxed and highlighted hair. Make an appointment for a consultation with one of the stylists at our Mokena hair salon today! A keratin treatment from Amato Hair Design helps to restore and restructure your hair by infusing a special blend of hydrolyzed keratin deep into the cuticle. The keratin is bonded to the hair cuticle with heat from a flat iron which relaxes the hair. The results? Super smooth hair with a soft silky texture that begs to be touched! How long does it take to get a keratin treatment? The length of time needed for a smoothing treatment depends upon many factors including the length of your hair, the thickness or density of your hair as well as its condition. We suggest scheduling a consultation with one of our stylists to receive an estimate on time and cost. 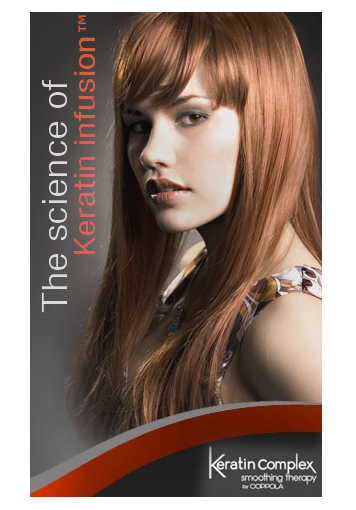 What type of results can be achieved with a Keratin Complex keratin treatment? One of the most immediate things that you will notice after receiving a smoothing treatment is the increased softness in the texture of your hair. Your hair will have a silky smooth finish and the amount of frizz and curl will be visibly reduced. Your hair will feel stronger and healthier. It will also be easier to manage, faster to dry, and more resistant to humidity. If I want to have my hair colored or highlighted, should I do this before or after a smoothing treatment? We recommend receiving a keratin treatment after you get a permanent color, semi-permanent color or highlights. The treatment will seal the color in, making it last longer and appear more vibrant. If you choose to have hair color applied after a keratin treatment instead of before, you should wait approximately two weeks before adding hair color. Can I get a haircut before my smoothing treatment or should I schedule it afterwards? We suggest that you schedule a haircut at our hair salon after your keratin treatment instead of before. After your treatment, your hair will have a smoother texture and will provide more precise results during the cuttin process.